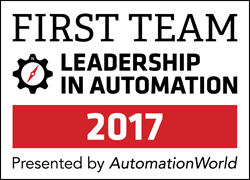 FLORENCE, Ky. (PRWEB) January 25, 2018 PMMI Media Group’s Automation World magazine has announced the First Team category leaders in the 2017 Leadership in Automation Program. Automation World, the leading business magazine serving automation professionals, launched this community-based program in January 2017. Automation professionals were invited to vote for their favorite automation vendors in unaided-recall surveys.